Integrated optical isolators have been a longstanding challenge for photonic integrated circuits (PICs). An ideal integrated optical isolator for a PIC should be made by a monolithic process, have a small footprint, exhibit broadband and polarization-diverse operation, and be compatible with multiple materials platforms. Despite significant progress, the optical isolators reported so far do not meet all of these requirements. In this paper we present monolithically integrated broadband magneto-optical isolators on silicon and silicon nitride (SiN) platforms operating for both TE and TM modes with record-high performances, fulfilling all the essential characteristics for PIC applications. In particular, we demonstrate fully TE broadband isolators by depositing high-quality magneto-optical garnet thin films on the sidewalls of Si and SiN waveguides, a critical result for applications in TE-polarized on-chip lasers and amplifiers. This work demonstrates monolithic integration of high-performance optical isolators on-chip for polarization-diverse silicon photonic systems, enabling new pathways to impart nonreciprocal photonic functionality to a variety of integrated photonic devices. B. Peng, S. K. Özdemir, F. Lei, F. Monifi, M. Gianfreda, G. L. Long, S. Fan, F. Nori, C. M. Bender, and L. Yang, “Parity-time-symmetric whispering gallery microcavities,” Nat. Phys. 10, 394–398 (2014). B. Bahari, A. Ndao, F. Vallini, A. E. Amili, Y. Fainman, and B. Kanté, “Nonreciprocal lasing in topological cavities of arbitrary geometries,” Science 358, 636–640 (2017). S. Hua, J. Wen, X. Jiang, Q. Hua, L. Jiang, and M. Xiao, “Demonstration of a chip-based optical isolator with parametric amplification,” Nat. Commun. 7, 1–6 (2016). Y. Shi, Z. Yu, and S. Fan, “Limitations of nonlinear optical isolators due to dynamic reciprocity,” Nat. Photon. 9, 388–392 (2015). D. B. Sohn, S. Kim, and G. Bah, “Time-reversal symmetry breaking with acoustic pumping of nanophotonic circuits,” Nat. Photon. 12, 91–97 (2018). C. R. Doerr, L. Chen, and D. Vermeulen, “Silicon photonics broadband modulation-based isolator,” Opt. Express 22, 4493–4498 (2014). M. Levy, “The on-chip integration of magnetooptic waveguide isolators,” IEEE J. Sel. Top. Quantum Electron. 8, 1300–1306 (2002). C. Zhang, P. Dulal, B. J. H. Stadler, and D. C. Hutchings, “Monolithically-integrated TE-mode 1D silicon-on-insulator isolators using seed layer-free garnet,” Sci. Rep. 7, 5820 (2017). M. C. Tien, T. Mizumoto, P. Pintus, H. Kromer, and J. E. Bowers, “Silicon ring isolators with bonded nonreciprocal magneto-optic garnets,” Opt. Express 19, 11740–11745 (2011). L. Bi, J. Hu, P. Jiang, D. H. Kim, G. F. Dionne, L. C. Kimerling, and C. A. Ross, “On-chip optical isolation in monolithically integrated non-reciprocal optical resonators,” Nat. 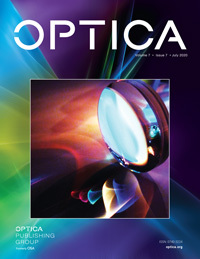 Photonics 5, 758–762 (2011). N. Kono, K. Kakihara, K. Saitoh, and M. Koshiba, “Nonreciprocal microresonators for the miniaturization of optical waveguide isolators,” Opt. Express 15, 7737–7751 (2007). D. Huang, P. Pintus, C. Zhang, Y. Shoji, T. Mizumoto, and J. E. Bowers, “Electrically driven and thermally tunable integrated optical isolators for silicon photonics,” IEEE J. Sel. Top. Quantum Electron. 22, 4403408 (2016). Y. Shoji, K. Miura, and T. Mizumoto, “Optical nonreciprocal devices based on magneto-optical phase shift in silicon photonics,” J. Opt. 18, 013001 (2016). D. Huang, P. Pintus, Y. Shoji, P. Morton, T. Mizumoto, and J. E. Bowers, “Integrated broadband Ce:YIG/Si Mach–Zehnder optical isolators with over 100 nm tuning range,” Opt. Lett. 42, 4901–4904 (2017). Y. Shoji, T. Mizumoto, H. Yokoi, I. W. Hsieh, and R. M. Osgood, “Magneto-optical isolator with silicon waveguides fabricated by direct bonding,” Appl. Phys. Lett. 92, 90–93 (2008). J. Fujita, M. Levy, R. M. Osgood, L. Wilkens, and H. Dötsch, “Waveguide optical isolator based on Mach–Zehnder interferometer,” Appl. Phys. Lett. 76, 2158–2160 (2000). M. C. Onbasli, L. Beran, M. Zahradník, R. Antoš, J. Mistrík, G. F. Dionne, M. Veis, and C. A. Ross, “Optical and magneto-optical behavior of cerium yttrium iron garnet thin films at wavelengths of 200–1770 nm,” Sci. Rep. 6, 1–10 (2016). P. Dulal, A. D. Block, T. E. Gage, H. A. Haldren, S. Sung, D. C. Hutchings, and B. J. Stadler, “Optimized magneto-optical isolator designs inspired by seedlayer-free terbium iron garnets with opposite chirality,” ACS Photon. 3, 1818–1825 (2016). A. D. Block, P. Dulal, B. J. H. Stadler, and N. C. A. Seaton, “Growth parameters of fully crystallized YIG, Bi:YIG, and Ce:YIG films with high Faraday rotations,” IEEE Photon. J. 6, 600308 (2014). X. Y. Sun, Q. Du, T. Goto, M. C. Onbasli, D. H. Kim, N. M. Aimon, J. Hu, and C. A. Ross, “Single-step deposition of cerium-substituted yttrium iron garnet for monolithic on-chip optical isolation,” ACS Photon. 2, 856–863 (2015). T. Mizumoto, R. Baets, and J. E. Bowers, “Optical nonreciprocal devices for silicon photonics using wafer bonded magneto-optical garnet materials,” MRS Bull. 43, 419–424 (2018). P. Pintus, F. D. Pasquale, and J. E. Bowers, “Integrated TE and TM optical circulators on ultra-low-loss silicon nitride platform,” Opt. Express 21, 5041–5052 (2013). E. Ishida, K. Miura, Y. Shoji, H. Yokoi, T. Mizumoto, N. Nishiyama, and S. Arai, “Amorphous-Si waveguide on a garnet magneto-optical isolator with a TE mode nonreciprocal phase shift,” Opt. Express 25, 452–462 (2017). Y. Shoji, A. Fujie, and T. Mizumoto, “Silicon waveguide optical isolator operating for TE mode input light,” IEEE J. Sel. Top. Quantum Electron. 22, 4403307 (2016). S. Ghosh, S. Keyvaninia, Y. Shirato, T. Mizumoto, G. Roelkens, and R. Baets, “Optical isolator for TE polarized light realized by adhesive bonding of Ce:YIG on silicon-on-insulator waveguide circuits,” IEEE Photon. J. 5, 6601108 (2013). D. Huang, P. Pintus, and J. E. Bowers, “Towards heterogeneous integration of optical isolators and circulators with lasers on silicon,” Opt. Mater. Express 8, 2471–2483 (2018). M. C. Onbasli, T. Goto, X. Sun, N. Huynh, and C. A. Ross, “Integration of bulk-quality thin film magneto-optical cerium-doped yttrium iron garnet on silicon nitride photonic substrates,” Opt. Express 22, 25183–25192 (2014). K. Solehmainen, M. Kapulainen, M. Harjanne, and T. Aalto, “Adiabatic and multimode interference couplers on silicon-on-insulator,” IEEE Photon. Technol. Lett. 18, 2287–2289 (2006). Y. Shoji, Y. Shirato, and T. Mizumoto, “Silicon Mach–Zehnder interferometer optical isolator having 8 nm bandwidth for over 20 dB isolation,” Jpn. J. Appl. Phys. 53, 022202 (2014). S. Ghosh, S. Keyvavinia, W. V. Roy, T. Mizumoto, G. Roelkens, and R. Baets, “Ce:YIG/silicon-on-insulator waveguide optical isolator realized by adhesive bonding,” Opt. Express 20, 1839–1848 (2012). Z. Wang, Y. D. Chong, J. D. Joannopoulos, and M. Soljačić, “Reflection-free one-way edge modes in a gyromagnetic photonic crystal,” Phys. Rev. Lett. 100, 013905 (2008). Z. Wang and S. Fan, “Optical circulators in two-dimensional magneto-optical photonic crystals,” Opt. Lett. 30, 1989–1991 (2005). Fig. 1. Schematics of the TM and TE isolators. (a) Illustration of the device layout. The red arrows represent the light propagation direction. (b) Sketch of the magneto-optical waveguide cross section for the TE isolator. The magnetic field is applied perpendicular to the film plane. (c) Sketch of the magneto-optical waveguide cross section for the TM isolator. The magnetic field is applied in the film plane. (d) Simulated Ex field distribution of the fundamental TE mode for the magneto-optical waveguide. (e) Simulated Hx field distribution of the fundamental TM mode for the magneto-optical waveguide. Fig. 2. Optical microscope and SEM images of the TM and TE isolators. Parts (a) and (c) show the optical microscope image for the TM and TE isolators, respectively. The scale bars are 100 μm. Parts (b) and (d) show the cross-sectional SEM image of the magneto-optical waveguides for the TM and TE isolators, respectively. The scale bars are 100 nm. In (b) and (d) the MO layer is colored in green and the Si waveguide in purple. Fig. 3. Forward and backward transmission spectra of the isolators. Parts (a) and (b) show the transmission spectra of the TM and TE mode isolators, respectively. The corresponding isolation ratio and insertion loss in the dashed regions are shown in (c) for the TM isolator and (d) for the TE isolator, respectively. Fig. 4. SiN-based microring magneto-optical isolator. (a) Optical microscope image of the SiN microring isolator. The gap between the bus waveguide and the racetrack resonator is 1500 nm. (b) Cross-sectional SEM image of the SiN magneto-optical waveguide. (c) Forward and backward transmission spectrum of the isolator. The inset shows the transmission spectra of three resonance peaks of the same device. (d) The peak positions of the forward and backward propagation light for multiple measurements.